Three youths were killed and two others injured in a violent clash between two groups at Paonta Sahib late last evening. Section 144 was imposed by DC Meera Mohanty this afternoon after eight jhuggis were burnt. Concerned over the large-scale diversion of forest land for hydroelectric projects, the Union Ministry of Forest and Environment is imposing more stringent conditions, including declaration of reservoir created due to construction of dams as reserved forest, as a pre-requisite for granting clearance. Residents of Hundu village near Shahpur today protested in front of the office of SP, Kangra, against the alleged lax attitude of the Shahpur police in investigation of murder of a village youth. The Vigilance and Anti-Corruption Bureau today registered a case against two persons for allegedly obtaining permissions under Section 118 of the Land Reforms and Tenancy Act in collusion with a senior IAS and an IFS officer. Members of the Bar Council of Himachal Pradesh along with members of the HP High Court Bar and the Shimla Bar Association today took out a procession from the District Court to Raj Bhawan on a call given by the All-India Advocates Action Committee against the proposed Legal Practitioners Act, 2010. This was stated by I N Mehta, vice-chairman of the Bar Council of HP. The Centre has approved a Rs 8.67-crore project for dairy development in three districts of the state. Secretary, Animal Husbandry, Ram Subhag Singh said the sanctioning committee headed by Rudra Gangadharan, secretary, Animal Husbandry and Dairying, Government of India, gave nod to the project under which each district would get Rs 2.9 crore. The mid-day meal workers union affiliated to the CITU today held a protest in front of the DC office here to highlight their demands. Three youths were killed and two others injured in a violent clash between two groups at Paonta Sahib late last evening. 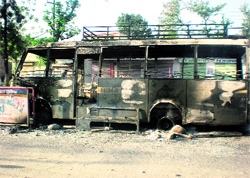 Section 144 was imposed by DC Meera Mohanty this afternoon after eight jhuggis were burnt by a violent mob in the town. Trouble started when two groups had clashed over a minor issue during the Holi fair on Tuesday. The groups, however, again confronted each other around 9 pm last night and it took a violent turn as they were armed with sharp-edged weapons and rods. The police arrived after three youths had been brutally murdered and their blood-soaked bodies were left on the Bypass Road. This sparked a violent protest from the local Bhatti community from the Heerpur area whose members had been murdered. They smashed windowpanes and doors of the local Community Health Centre, where the bodies were kept, and blocked the NH-72, besides torching a police bus. Two critically injured youths Sagar and Sherry were referred to the PGI, Chandigarh, and Dehradun, where their conditions were stated to be serious. Though SDM Manmohan Sharma tried to broker peace between the two groups last night around 3:00 am, trouble began this morning when the three bodies were handed over to their relatives after a post-mortem examination. The tractor carrying the three bodies was parked on the road and a mob burnt eight jhuggis where the people of other community resided. The police failed to control the mob as women too joined it. The police had to resort to a lathi-charge to disperse them. The NH-72 was also blocked. Another mob comprising 400-500 people then tried to enter the town from the Y-Point and the police had to fire 12 to 15 rounds in the air to disperse them. All shops and business establishments were forcibly shut by the mob before the curfew was enforced. No loss of life was, however, reported as the jhuggis had been vacated last night as its residents feared an adverse backlash after yesterday’s violence. Additional SHO Dharam Pal and head constable Sat Pal were placed under suspension for their failure to attend to the complaints of clashes in time. IG Ashok Sharma, who arrived here this morning, said around 250 policemen had been posted here and the situation was under control in the afternoon. Only five persons were allowed to attend the cremation of the three youths, Sushil, Anil and Sanju, as a precautionary measure. The rites were conducted amidst a heavy police posse. Three separate cases had been registered with one case of murder against eight youths, another against a mob for rioting and third one also against a mob for torching a police bus. About 8-9 youths had been apprehended and efforts were on to trace those involved in the murder. The new conditions have been imposed in respect of the 402 MW Shongtong-Karcham projects and the 130 MW Integrated Kashang-Stage II and III being executed by Himachal Pradesh Power Corporation Limited. Apart from the surface area, the forest area involved in underground works like tunnels and powerhouse will also be included while calculating the quantum of forestland for diversion. The diverted area will remain as forestland even after acquisition by the company implementing the project. Apart from standards conditions like maintaining 15 per cent flow in rivers at all times and muck disposal at pre-designated sites to avoid its rolling down, it will be mandatory to set up ecological monitoring unit to monitor the impact of the project on the flora and fauna of the area. While carrying out compensatory afforestation, only those species will be planted which were destroyed or affected due to diversion of forestland. Further, the impact on the flora and fauna due to camping of labourers in the project area during the construction phase of 48 months has to be kept at the minimum by providing alternate fuel for cooking and heating. The workers usually resort to lopping and even felling of trees for fuel wood. In all, 63.5015 hectare of forest land is to be diverted for the construction of the Shongtong-Karcham project and 17.6857 hectare for the Kashang project. Since the Lipa and Asrang Wildlife Sanctuaries are within 8.5 km from the Kashang project, the forest advisory committee while recommending the project for approval also laid down that the Environment Impact Assessment (EIA) and Environment Management Plan (EMP) plan should be placed before the Nation Board of Wild Life. 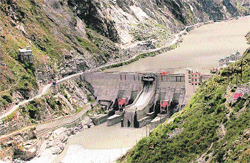 As 36 major projects have been planned in the Sutlej basin which has potential to generate 9880 MW of power, the ministry has asked the government to carry out a comprehensive study to assess the cumulative ecological impact of such projects on aquatic fauna and flora, biodiversity of the riverine ecosystem and the surrounding areas and ecological integrity of the river system. The state has already made a presentation before the committee approval of Terms of Reference for the study. 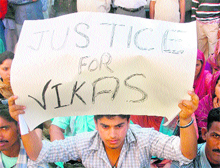 Vikas Jamwal was found murdered along the road near the village on March 19. Though the police registered a case under Section 302 of the IPC in the matter, no arrest has yet been made. The protesters, while complaining to the ASP (headquarters), Kangra, Sanjeev Gandhi, alleged that they had given certain clues to police officials regarding the murder. However, the police was not taking any action. The ASP pacified the protesters and said a special team under a DSP was being formed to investigate the case. After assurance from the ASP, the protesters were pacified. A case was registered by the Vigilance Bureau under Section 8 of the Prevention of Corruption Act against Vivek Dogra alias Dimple, a Shimla property dealer and Vinod Mittal, an industrialist of Nalagarh. Sources said the Vigilance had got a tip-off about the alleged favours sought by the two from senior officers through telephonic conversations. In fact, vigilance sleuths had even questioned Mittal about his role in the Section 118 sanctions obtained for various people two days back. The Vigilance sleuths are probing the role of a senior IAS officer and an Indian Forest Services officer for granting permissions under Section 118 and other mandatory clearances. Additional DG, Vigilance, KC Sadyal confirmed that a case had been registered against the two persons. The Centre has approved a Rs 8.67-crore project for dairy development in three districts of the state. Secretary, Animal Husbandry, Ram Subhag Singh said the sanctioning committee headed by Rudra Gangadharan, secretary, Animal Husbandry and Dairying, Government of India, gave nod to the project under which each district would get Rs 2.9 crore. District secretary of the CITU Joginder Kumar said though the government had been spending huge amount on this scheme, mid-day meal workers were being paid a pittance. The activists raised slogans against the Central and the state governments and demanded regularisation of their jobs, giving them minimum wage regularly and granting them leave, pension and provident fund facility etc.